Planning to start cycle commuting to work? Good choice! You’ll save money, and you might even arrive faster than by car. Not to mention you’ll skip the need for a cardio workout each day. Commuting to work by bicycle has so many upsides; some employers are even incentivizing it. However, if you’re planning to start cycling to work, be careful! If you ride the wrong type of bike, your adventures in two-wheeled transportation may be short-lived. Trust me, your rusty old beach cruiser or department store mountain bike won’t cut it. Especially if you’re riding it five times per week! Don’t believe me? Try it. If you want to ditch the vehicle for good, it is essential to pick the best possible urban commuter bike for your daily trip to work. Just as you’d invest in your car, you should do the same with your bike. It will pay dividends! So what’s the best bike for cycle commuting anyway? That’s the question I’ll be tackling in this article. Rather than look at individual models, I think it’s best to identify specific bicycle categories. We’ll check out four great bike styles that are nicely suited to your daily commute. Within each style I’ll review a great, affordable commuter bike example to investigate. What about styles to avoid, common mistakes and red flags? You bet! I’ll cover them too. The road bicycle has enduring popularity in the cycling world. They’re fast, light, nimble and efficient. They are the ‘sports car’ of the cycling world, and they’ve been around for about as long as bicycles have existed. It’s no wonder, then, that many riders find them appealing. Anecdotally, I see more road bikes commuters than any other style in my city. But how do they stand up to the task of commuting? A road bike’s light weight, high speed and quick steering will serve you well in city traffic. An aggressive stance means you’re leaning over the handlebars. That can be a little freaky until you get accustomed to it. Those dropped bars are intended for aerodynamics, not comfort, and efficient riding is often only achieved when properly attired with cycling shorts, jersey and clipless shoes. So is a road bike your best choice for urban commuting? That’s up to you but they can be awesome. Back in the days of Eddy Merckx and Jacques Anquetil, if you wanted a specific road bike style, there weren’t many options. Today, however, you will find that the road bicycle segment is subdivided into many categories. While they all feature aggressive frame geometry and they all lack suspension components (ie. shocks), there are a lot of unique styles to choose from. Choose your handlebars: It may be the “classic look”, but a road bike doesn’t need to have curled drop bars. In my opinion, the best commuter road bike handlebar style is often a straight bar, similar to a mountain bike. It gives you a more upright stance while riding, improving your vision and visibility. Your aerodynamics will suffer a bit, but that’s OK. Choose your groupset: The difference between the best and the worst urban commuter road bike is often the groupset. A groupset is a collection of matched components. The term typically includes the shifters, derailleurs and brakes, and sometimes also the crankset and chain. There are different price tiers; in general, the pricier the groupset, the better and more smoothly it will shift. The Shimano 105 system is an example of a good groupset that’s pretty popular. Shimano Sora, meanwhile, is a more budget-oriented groupset. Carbon fibre is optional: OK, you might be tempted to get the lightest, sleekest, sexiest carbon fibre road bike for your commute. My advice? Resist that urge! Your commuter road bike is going to be in rain and traffic. It’s going to get dirty. You might have to lock it up outside. I suggest you get a good chromoly or aluminum framed bike that you don’t mind wearing out. Go for strong components and beefier tires. Save the high-priced race stuff for your weekend fun time. Pros: Upright riding position, tough as nails, built for control. Cons: Won’t be as speedy as a full-on road bike with drop bars. In the road category, I’d suggest something like the impressive, affordable and durable Diamondback Haanjo. This bike has been built to mix the fun of road riding with the ability to hit a bit of trail on occasion. Precisely defined within the road bike subcategory, this is probably considered a cyclocross. It has a less aggressive stance, and it is outfitted with a straight bar for a more upright seating position. It features a 70-degree head tube, so you’re quite a bit more upright. The frame is 6061 aluminum alloy. That makes the bike reasonably light, though aluminum does transmit vibration. The front fork is actually carbon fibre, which I think they included to reduce weight (since the larger tires and components would make it heavier otherwise). It’s about 23.5 pounds when fully assembled, which is fairly light for the price point and the size of the tires. Have I mentioned that it’s gorgeous? Because it is gorgeous. This is (in my opinion) one of the best commuter road bikes for urban riders because they built it to withstand the rigours of a hard daily ride. It is built more for durability and handling than all-out, top-end speed. The slacker frame geometry gives you precise control when maneuvering through traffic, and the Haanjo is fitted with Acera derailleurs and shifters, featuring a 1×9 drivetrain that’ll handle hills and flats. The crankset is single ring forged, and it has a sealed cartridge bottom bracket. The tires are an impressive 32c with beefy tread. You can always switch to slicker tires if you want to roll faster. The Diamondback Haanjo reviews well as a commuter bike, as well as for recreation. Your commute would be enriched by this or something similar. With how quickly our world is becoming urbanized, I’m surprised that it has taken the bike industry so long to jump on the trend. City-specific urban commuter bicycles with good utility are popping up all over the place. They haven’t gelled into an identifiable style like mountain or road yet, but urban frames are some of the best bikes for commuting due to their utility. So what classifies an urban bicycle anyway? As I mentioned there isn’t one specific identifying feature that I can put my finger on. Rather, a city bike is best defined by the purpose for which it was built. They often have clean, spare frames without a ton of doodads. They’re built to hold all your accessories, bags and lights, so the manufacturer wants the frame to be as clean as possible. That aesthetic matches stark skyscrapers and asphalt streets pretty well too. An internally-geared hub is popular on many of the most popular urban style commuter bikes. Why? Not only does it lend a nice, clean chain line, it also does away with the derailleur. Internal hubs require less maintenance, and they don’t stick out from the side of the bike. Furthermore, you can shift gears at a standstill; that’s handy if you need to accelerate quickly to get around a bus. Many city bicycles feature integrated racks and baskets. If you’re commuting, you’ll appreciate having somewhere to stash your briefcase, computer, phone, wallet, extra clothes, lunch, etc. Integrated racks save you a bit of money and tend to be more solid and secure than third party racks. And then there’s panniers. A quick-release pannier bag is a godsend when you have a meeting to run to. An upright riding position and excellent handling ensure that you’ll see the road and maneuver quickly. The lack of suspension components means there’s no mushiness when accelerating or decelerating, so you can react swiftly to changing conditions. Long-distance, high-speed, and rough terrain commutes will be less comfortable on an urban bike, but shorter trips through city traffic are where this style shines. Urban tires are usually a bit wider than those on a road bike, and they’ll feature a bit more tread, though not nearly as much as a mountain bike. They are primarily designed to give you traction on wet or dry pavement. Here’s a fine example of a good quality city commuting bicycle with many of the features outlined above. 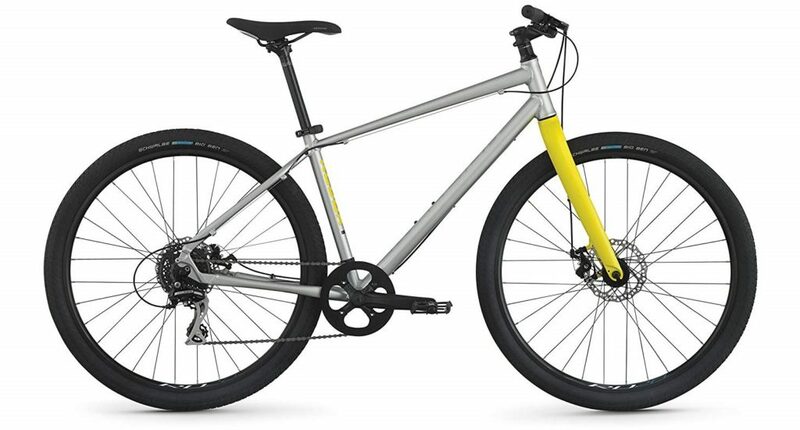 The Redux 1 is a simple yet beautiful bike from Raleigh which is well suited to riding life in downtown terrain. The Redux features a clean, diamond shaped frame that’s made from aluminum alloy. The whole aesthetic of the bike is modern, aggressive, versatile and strong, and it is a great looking ride. It doesn’t have any suspension components (shocks), and the riding position is upright, comfortable and aggressive. That’s ideal in a good city commuting bike. It has mountain-style handlebars with a slight rise to them. The seating position is neutral, right over the pedals. If you need to gun it, you always can. The Redux 1 features an 8-speed Shimano rear derailleur. That’s perfect; eight speeds is about all you honestly need for an intra-city commute. I’d have loved to see an internally geared Nexus hub which you can shift at a standstill, but the external derailleur keeps the price accessible. Raleigh has thoughtfully added Tektro Novela mechanical disc brakes to the mix. Mechanical discs don’t really have much advantage over linear pull, but they look cool and can handle mud, slush, and wet weather better than linear pull. The wheels are 700c in size, and the tires are 35c Schwalbe Big Ben tires, which are awesome for pavement riding. The Redux isn’t terribly heavy, but it’s not a feather either. If you’re hoping for something lighter, you’ll want to look at a road style commuter instead. 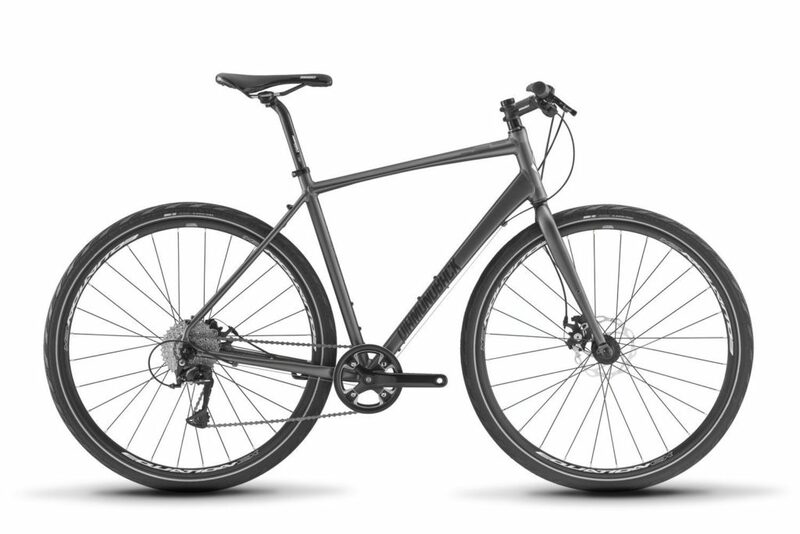 The Raleigh Redux 1 is a good urban / city bicycle to commute or play, and it’s available at a great price point. One of the least appealing things about city bike riding is storage. In my apartment building, I have to cram my precious ride in with hundreds of others. Scratches are inevitable, and hauling my full-sized frame in and out of the tiny bike room is no fun. A folding bike takes care of that problem. There are many excellent commuter-friendly folder bikes that can be stashed in a closet or the trunk of a car when completely folded up. First, you’d be surprised how fun, fast and capable a small-wheeled folding bike can be! They often can compete with full sized rides in the city. Their only disadvantage is top-end speed, which isn’t usually a primary concern in an urban commute. Second, there are actually many full-size folding bikes out today, so it’s no longer an excuse. They vary in form and function, but most folders are fantastic for any trip to and from work. Once you arrive, you can break it down in seconds and carry it inside. Some even come with their own storage cases. Absolutely! A 700c folding bicycle will compare admirably to a non-folder in most aspects. The one common shortfall is a lack of gears, but even that is changing. SwissBike, for example (a brand that became famous for their “backpack bike”), has a line of folding mountain bicycles that have up to 30 speeds at your disposal. The Montague FIT has 30 gears too. It’s huge. Suddenly, an apartment dweller can store a full-sized ride without issue. And your car doesn’t need a bicycle rack anymore. 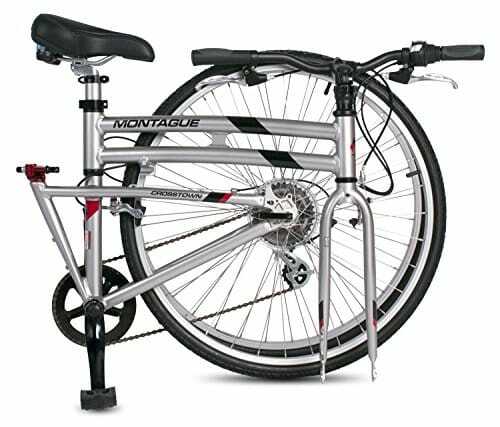 With the impressive, full-sized, folding Montague Crosstown bike, most of your friends will notice that the frame is a little irregular, but they’ll have little idea why. You’ll enjoy the looks on their faces when you demonstrate that this bike folds up! Montague has many models utilizing essentially the same frame. There is a quick release lever on the top tube, which, when released, essentially allows the whole frame to pivot around the seat tube. So when it is folded up, the whole thing is only slightly wider than the 700c wheels. It’s a brilliant system that allows the frame to fold without interfering with either the drivetrain or the chain line. Functionally, the bike rides much like a sport hybrid (or a city bike). It has no suspension parts and a neutral, upright riding position. It is fast, zippy, maneuverable and it accelerates quickly from a standstill. Componentry is fairly basic. There are 7 speeds to play with, which are controlled with a grip shifter paired to a Shimano Altus rear derailleur. It rolls on Alex wheels with Formula hubs, and it stops with basic Tektro dual pivot brakes. 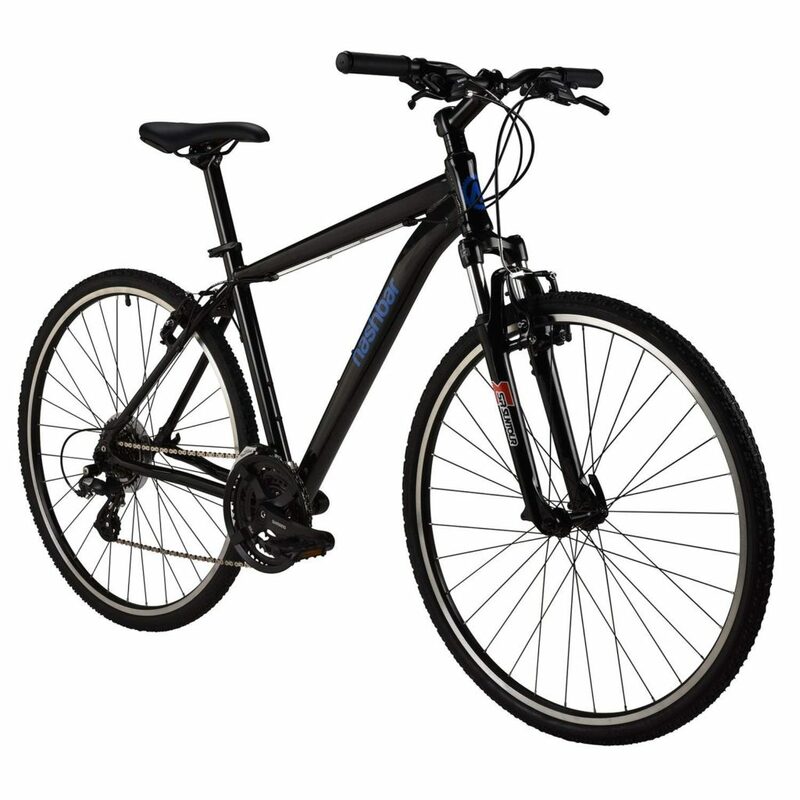 It’s about on par with a conventional sport hybrid in this price range, except that you get the amazing folding frame. The weight is a respectable 27 pounds. I would suggest that any Crosstown owner replace the seat, as it’s not the most comfortable. I’d also caution that adding a rear fender will be tricky to impossible. You’re best off to add one of the seatpost mounted varieties. Most rear luggage / pannier racks are unlikely to work with this frame, at least not without some swearing. It’s a quick and fun full-sized ride, and for the price it’s probably my favourite folding commuter bicycle for urban riding. I recently purchased a dual sport bicycle and I have been absolutely loving it. Years ago when the hybrid bike came out, it offered something that was greatly needed: a compromise between the off-road riding of mountain bikes and the pavement prowess of the road bicycle. Unfortunately, you ended up with a bicycle that excellent at neither. Today, I’d classify many hybrids as ‘casual’ bikes: great for a tootle around the cul-de-sac, but average on pavement and miserable on trails. Manufacturers recognized the need for a bike that could handle both jobs. Because trails riding is demanding, that meant creating a bike that had beefier tires and suspension than your average hybrid, but not so beefy as to be unwieldy on pavement. Enter the dual sport bicycle. A dual sport has much of the geometry of a mountain bike, just toned down. They have 700c wheels, wide handlebars, and front forks with a generous amount of travel. They have a lot more clearance than your typical hybrid, and they’re often equipped with disc brakes. If you have the option to take your daily journey across some trails, a dual sport is one of the best commuter bicycle styles around. I can attest to how much fun they are. Cons: Not many options for luggage racks, etc. If you’re thinking about both work and play, Nashbar’s attractive, dual sport hybrid bicycle is pretty awesome. It’s a nice and stealthy bike without too many stickers or flashy paint, but trust me that it still turn heads. This inexpensive little hybrid is perfect for cycling to work, but you could easily enjoy some time on the trails, zip around town, or just cruise the boardwalk. It’s the versatility that drew me to this category in the first place. Unlike most of the bikes listed here, this one comes with a bit of suspension. 63mm Suntour shocks smooth out the ride. I’m not really into suspension parts for urban riding, but I must admit that this shock is nice for when you need to tackle a high curb or pothole. The bike features 24 speeds in total courtesy of the Shimano EZ-Fire shifters. It’s a pretty common setup but it shifts crisply, which is all I ask. To stop, the bike has twin Tektro discs. They look great and do the job. Weinmann rims and Formula hubs keep you spinning, while hefty 35C Kenda tires provide steady footing in slippery conditions or dry tarmac alike. This bike isn’t feather-light either, but an aluminum frame keeps it from getting unwieldy. The frame itself has an attractive oversized tubing and a pleasing silhouette. The riding position is fairly neutral with your weight over the pedals and not too much strain on your forearms. The only downside is the lack of storage. You’ll need to add a luggage rack if you want one. Fortunately, the low price point ensures you’ll have a few spare dollars to do that. Overall, this is a great choice for any city-dwelling commuter looking for a cheap bicycle to ride to work. That’s the list. If you have any questions or need clarification on anything in this article, please feel free to leave a comment below and I’ll try to respond. I am switching from a Trek Triton to something that is an urban commute style cycle – I like the concept of disc breaks and a closed hub. I don’t want to spend a ton of money and am not opposed to buying used. I have a bit of a weird geometry though. I have a long torso and short legs (my inseam is 28.5″). Do you have half a dozen recommendations for a bike? thank you! Concerning urban bikes. I am riding a jam is commuter 3 which has similar characteristics to the Redux but I find both lacking as commuters. Heavy-duty frame and wheels to carry extra weight. Integrated less front rear and sides. My idea is comfort, durability, low maintenance and safety over speed and esthetics.